It is rare that Daddies gets the spotlight in parenting especially when it comes to events specifically tailored for them in mind. 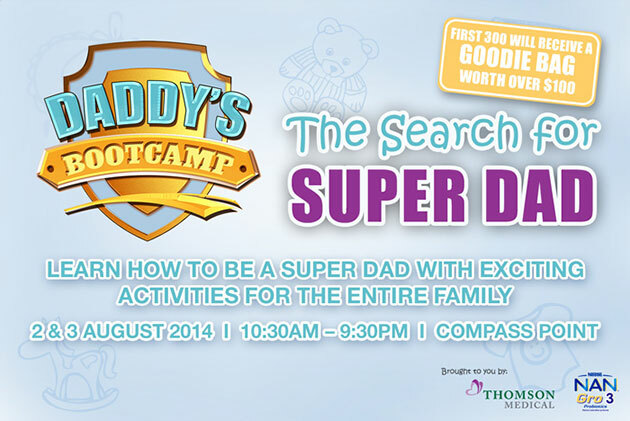 Thus when Daddy's Boot camp set up its 'headquarters' at Compass Point, I decided to join in the fun in 'The search for Super Dad'. Daddy's boot camp is a 2 day event held on 2 & 3 August catered to Dads with activities to 'train' the parent in them. This is the second year Nestle Nan Gro 3 and Thomson Medical Center had jointly organized the event. This event was deemed as the Graduation edition. There was an appearance by celebrity Mommy, Evelyn Tan, sharing her parenting experiences with 4 children. According to her, Daddy Darren, plays an important role in parenting and they work as a team to take care of their brood. Mommies are the best role models for Daddies to learn from. Mrs Wong Boh Boi , reputable senior pare craft lactation consultant from Thomson Medical Center, gave some tips on how you could massage your baby and to bond with them. With methods such as Lazy Lion and Kangaroo hop, there are lots interesting ways you can interact with your babies. After the lessons, it was time for Daddies to share the stage with Mommies in a friendly competition to see which couples know each other best. It was a warm hearted affair as we had the parents giving opposing answers to questions like what time the child is born. There was a standout Daddy who seem to know almost exactly what the wife is thinking. Personally, I thought this was a good exercise to check if Daddies are playing their part in parenting. Other than the stage activities, the youngster ones have their share of fun with various stations encouraging play. There are challenges for toddler too such as baby crawl. The main event will be the search for Super Dad. This 2 part challenge consist of a Dad and child lookalike and a smiling contest. It was heart-warming to see the Daddies working hard to cajole a smile from the little ones. From their efforts, you could tell the Daddies had experience with this as they executed their tried and tested methods of making this child smile. The search for Super Dad concluded with Mr Goh as the winner. Nontheless all the daddies are winners in my eyes for their willingness to share an experience with the child. For new Moms and Dads who would like to learn more about caring for the baby, you can sign up for a 6 weeks childbirth educational course at Thomson Medical Center. And if you are looking for formula milk for your baby when they get older, Nestle Nan Gro 3 is one brand you can consider. I like the idea of having events catering for Daddy. With such events, the role of Daddy can be highlighted. New dads can also learn a thing or two and those thinking about Fatherhood can be inspired to join in the club. Daddy's boot camp is just a start, wait till they get operationally ready!